The EU drives initiatives, targets and actions across all 28 member states to reduce Greenhouse Gases (including CO2), obliging each state to achieve agreed reductions. 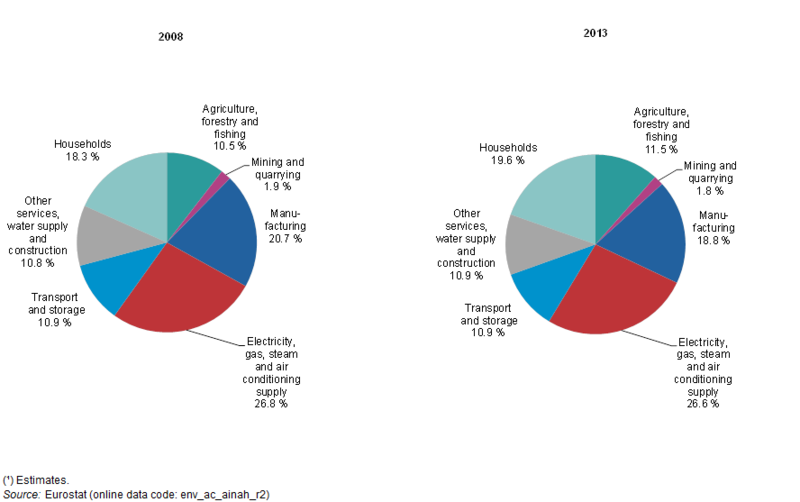 The EU monitors progress at an annual european semester and reports to the UN regularly The table below from a Eurostat report shows the sectors that need to be tackled to reduce GHGs. Electricity/gas/steam/aircon emissions excludes combustion in individual houses or households – included in Households. Transport excludes vehicles for non-transport businesses and private vehicles – included in Households. Although it can be seen that the proportions have changed little between 2008 and 2013 the absolute totals have reduced by 11.8% over this period. In fact in July 2016 the 2014 figures reported by Climate Home showed that the EU had already achieved its targets for Greenhouse gas emissions and were 24.4% below the 1990 baseline. To minimise Global Warming – every Country in the EU (and across the world) needs to be ‘highly ambitious’ and do everything it can to reduce greenhouse gas emissions in every sector as much as possible and as quickly as possible. The EU is a Party to the UN Climate Change Convention and signed the Adoption of the Paris Agreement document on behalf of all the EU member countries in Dec 2015. (p23 para 18). The formal Agreements, held by the Secretary-General of the United Nations in New York, are also to be signed by every Party, including the EU and each member state between 22nd April 2016 and 21st April 2017, as are their ratifications accompanied by Nationally Determined Contributions. For the UK it was signed on the first day by His Excellency Lord Bourne of Aberystwyth, Parliamentary Under-Secretary of State for Energy and Climate Change. The EU will ratify, following ratification in each State and the consent of the European Parliament. It is these actions that will need to be much more ambitious from every EU country to fulfill the Higher Ambition. And these are either covered under the ETS or by national emission targets. and these include a reformed ETS. The effects of the 2030 Framework are evaluated in DG Climate Action scenarios. 45% of total EU emissions come from aviation, power and industry that are covered by the EU emissions trading system (ETS) and the target is for these emissions is to be 21% lower than in 2005. So, until 2020, international aviation emissions have no restrictions. Note: Emissions from forestry are also not included. 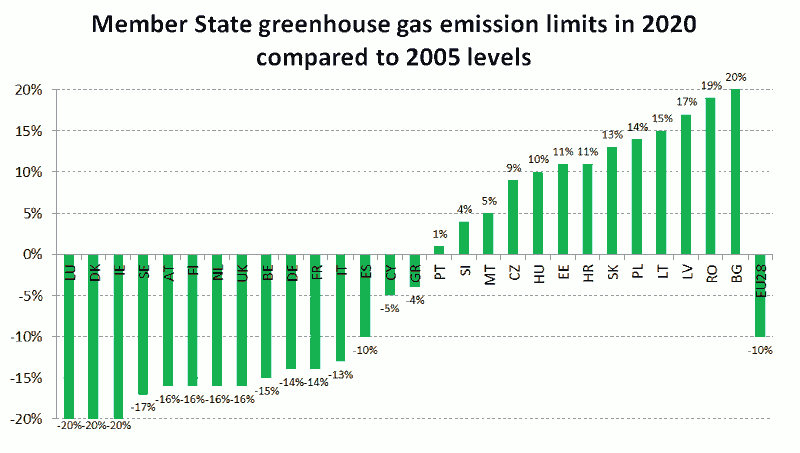 The Annual Emission Allocation per EU country up to 2020 is shown here. These binding annual targets are committed to under the effort-sharing decision for cutting emissions (by 2020 compared to 2005) for sectors not covered by ETS. Progress is monitored by the Commission every year. Note: The Household Sector also includes personal transport and electricity/gas/steam/aircon emissions from individual households – neither covered here. EU countries must draw-up long-term national building renovation strategies which can be included in their National Energy Efficiency Action Plans. Tracking and reporting on meeting nearly zero-energy. ‘Nearly zero-energy’ for new buildings is reported for each country. Click here for progress reports and national plans. The EU commission is consulting on changes to the VAT rules, whereby countries may be able to have more discretion as to which items can be zero rated. But under existing (non-ambitious) legislation, the EU ruled in June 2012 that VAT on solar (and all other Energy Saving Materials) in the UK should be at standard VAT (20% instead of 5%). And in Feb 2013 the European Commissioner took the UK to the European Court of Justice for a ruling. In Nov 2015 the intention of the UK Government was to increase the VAT on solar panels to comply at 20%, but Greenpeace reported in March 2016 that the Chancellor had announced that “installation of all energy saving materials including solar panels, wind turbines and water turbines will also continue to benefit from the current, reduced rates of VAT. New Build – Go back to the Zero Carbon build regulations revoked in July 2015 that stated that, from 2019 all new buildings must be ‘zero carbon‘ . Adopt the Building Research Establishment Home Quality Mark for new homes to show purchasers/renters the quality standard and efficiency features. Encourage growth of electric transport by allowing parking/charging at new properties. Retrofit – Introduce a replacement to the ‘Green Deal’ based on market research of methods of ‘selling’ to property owners. To be (even slightly) ambitious the emissions from International flights need to be included in trading schemes – or other measures that will reduce the hidden subsidy that allows flying to increase. Forests and Agriculture, for industrialised nations, are accounted for and governed by the Kyoto Protocol (77 kB) adopted in 1997. The EU issued a consultation, concluding on the 18th June 2016, addressing greenhouse gas emissions from agriculture and LULUCF and this could be part of it’s Higher Ambitions.